Every day morning at 5.00 am "Nirmalya Pooja" takes place and during that time the Devotees have an opportunity to see the Swayambhoo Lingam. Every day Trikala Pooja is performed in the Temple. Thousands of devotees visit the temple to find solace, from their problems, pains and difficulties or to dedicate their religious vows or to enjoy the natural scenic beauty of the environment. Thousands of devotees from various states are visiting the Shree Kshethra on every Tuesday, Friday, and during the month of Shravana or on the Moola Nakshathra day of the months of Phalguna (Which is the birthday of Shree Devi) Important Politicians (Representatives of People) Film Stars, major Industrialists etc are visiting this Temple regularly. The famous singer Mr. Jesudas is performs Chandika Homa seva and "darshan" of Devi, every year on his birthday. The Temple celebrates all traditional Hindu Festivals and during the days of Navarathri Festival the visits of the Devotees reaches the peak. "D. Ella Vyalle" has written that being the abode of Mookambike, Kollur has become one of the important pilgrimage Centre. This place is very sacred and devotees from within and outside the Nation are visiting this place on pilgrimage and perform penance and other religious worships and return with protected feelings. About 50% of the devotees visiting this Temple are from Kerala and 25% are from Tamilnadu and 25% are from Karnataka. Devotees from Andhra and Maharashtra are also visiting the Temple. The Temple is undertaking major social works. Many Highschools and Pre-University Colleges are maintained by the Temple around Kollur. Good lodges and Parks are set up for the benefit and comforts of the Devotees visiting the Temple. 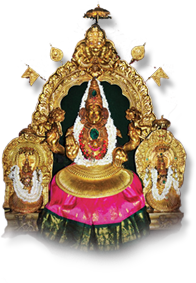 Subscribe to Kollur Mookambika Temple Email Newsletter & receive updates right in your inbox. Copyright @2018 Sri Mookambika Temple, All Rights Reserved.